Competency-based education (CBE) is a hot topic in the education world today. According to the U.S. Department of Education, CBE transitions "away from seat time, in favor of a structure that creates flexibility, allows students to progress as they demonstrate mastery of academic content, regardless of time, place or pace of learning. Competency-based strategies provide flexibility in the way that credit can be earned or awarded, and provide students with personalized learning opportunities." CBE allows instructors to respond to the needs of many learners with a more adaptable educational experience that accommodates busy lifestyles, which can include working and caring for family members. In doing so CBE is transforming the way instructors interact with their learners, how they think about the content they are teaching, and how they deliver it. 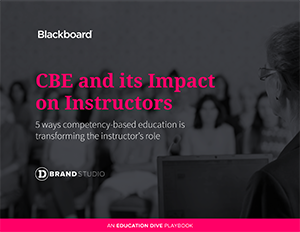 Download this playbook to explore how CBE gives you the opportunity to rethink what you've been doing and opens up ways learning can be done differently.